Are Your Sales & Marketing Working Together? For most small businesses and startups, the customer is the lifeblood of the business. You never have enough & you always need more to make the engine run. So, having a clear plan for acquiring customers is really important. The sales and marketing activities in any business are like two gears, they work together to generate customers. Marketing brings in leads, and sales turns them into customers. Related, but not the same activity. Lots of young companies don’t see the connection between these two parts of their business, or they focus too much on one or the other, hurting their ability to succeed.  Here at Pitch Deck Fire, we’ve helped build many sales decks and sales& marketing collateral for clients. Through that experience, we’ve put together this short list of best practices that can allow you to develop your sales and marketing processes and collateral as a unit–working together–instead of two disparate functions. Marketing is the process of making the customer aware of how much better off they will be now that your company is in existence. Sales is the process of completing the transaction so that both parties are better off than when they were alone. Marketing gets leads for the company. And sales closes them. The marketing message and the sales message need to have the same general tone and materials need to be in a cohesive branded design style, but they have very different objectives. Marketing is all about the soft-touch, the first impressions the company makes. Sales is where the deal is won or lost. It is the commitment part of the buying relationship. Sales’ job is to convert the customer from a skeptic of the brand and how it could possibly be worth what you are asking, to an advocate of the brand and the value they now can’t live without. Good design on top of a bad sales process might work just from shear luck and numbers, but there are likely many missed opportunities slipping through the cracks. Bad design on a good sales process often works from brute force and usually involves lots of time, effort and hand-holding. We find that when good design and good strategy combine, the results are effortless and smooth. Like cutting through butter. Missed opportunities can be captured with a better way of operating your sales funnel and clear messaging about your offering in all collateral. Figuring out this “better way” for your company requires pause. Pause gives you time to reflect and to do a little backing up to make sure you have the full picture. Getting your messaging and process clear up-front allows you to align sales, marketing and a strategy to move customers through the buying process and will help you drive faster growth and better outcomes in all your sales efforts. This is the heart of a successful organization, and marketing and sales alignment is the backbone of scaling and growing in a financially sound way. Do you know your customer? If you can say clearly who your customer is and get very specific on what they do and how they are then you should have great insight into where they are looking for or finding out about your product. Have you defined all the possible channels you can engage them through? Knowing which tactics you could try and estimating effort and outcomes is a great starting point for defining metrics in your sales efforts. Do you know clearly what you are trying to achieve in each interaction with the customer? Knowing successful outcomes you want your company to create with your customers, gives structure to an otherwise unstructured process. Knowing what you are trying to get out of customers, channel partners, and other advocates of your brand will help you custom tailor your sales strategy and marketing design to fit and help ease the sale. And don’t stop with what’s in it for you, instead answer – What’s in it for our customer? Channel Partner? or other Advocate? How are you addressing their pain points and buy-trigger-points? This is one of the key points to address when working on your marketing and sales messaging. What are the reasons a customer buys your product? The trigger point? Understanding how your offering fits into your customer’s lives can really help you design relevant and attractive marketing collateral. Knowing your customer is the key to all of this effort. Once you understand your customer’s behaviors and motivations, you will begin to better understand your product and its usefulness to them. How does this solve all of their problems and how do we tell that to them in the most concise way possible? Where they are? When they are interested? After you know your customer, knowing which marketing tactics you want to employ are key. Everything from Facebook Ads to Door-to-Door Flyer Drops need to have the target’s pain points in mind as they make their case for a call to action. There also needs to be an effective call to action. This should be an introduction to learn more about the company or engage in the sales and learning process with someone from the sales team. Setting this hand-off up from the beginning is important so that it’s easy for your customer to buy your product. Anything from a link that doesn’t work to an unclear call to action can deter an unsure client and lose you a sale. If you don’t have clear pricing or ranges that people can make decisions on, you are doing yourself and your clients a disservice. Use pricing and pricing tiers or packages to better structure your sales calls and help people decide what’s best in an easy to communicate fashion. This is the part where good design can really help you communicate your sales message. If you have your sales process, pricing and product offerings (even in service based businesses) simply articulated in a visual, easy to follow way, you’ll reduce friction, raise sales, and maybe even skip expensive sales calls altogether! Marketing and sales are two different but very connected activities. Knowing your customer and using that information to inform and simplify your processes, as well as lead the messaging on your collateral will ensure that you resonate with your potential clients and give them a path to buy. Good and well thought out design is important to executing this effectively through all channels and collateral.